Scribble Jam #9. 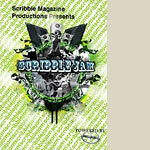 Another successful year, straight outta Ohio, for the annual Scribble Jam. MC battles, DJ battles, B-Boy battles, and Graff exhibitions. You definitely need to peep this. This also includes superb performances by The Living Legends, Sage Francis, Brother Ali, Illogic & Blueprint, Eyedea & Abilities, Glue, and more!!!! !